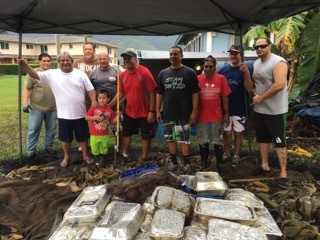 Many thanks to Enid's son Keanu for making the imu, and to all those whose many hands made light work of preparing the kalua pig and pounding the cooked breadfruit and taro to make poi! See photo montage. 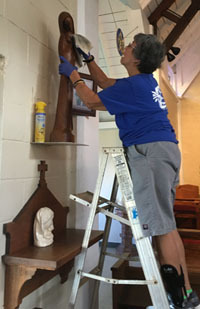 Mahalo to Our Christmas Cleaning Menehune! We are very grateful to the dedicated aunties and uncles who cleaned, polished, and decorated St. John's on Saturday, December 22. Mahalo nui to Aunties Ipo, Omi, Tensy, Sally, Phyllis, Vicki, Jan, Enid, and Sheila, and to Uncle Jerry and Father Nahoa! Aloha no! 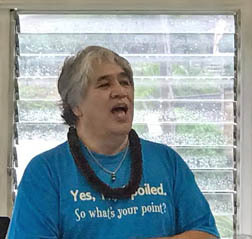 Mahalo Nui to Fr. Malcolm Keleawe Hee! Warm thanks to Fr. Malcolm Keleawe Hee for celebrating the Holy Eucharist with us the two Sundays in November that Fr. Nahoa was away. Mahalo also to Fr. Keleawe for taking this photo of the congregation on November 18! 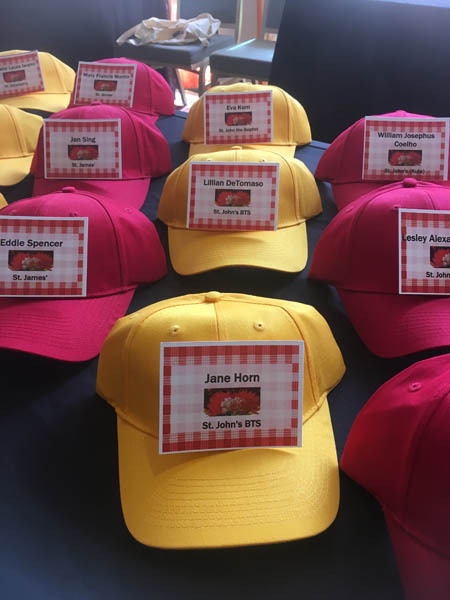 Father Nahoa sent this photo showing how two of St. John's dear faithfully departed members (Jane Horn and Lillian DeTomaso) were included among all of those commemorated at the annual diocesan convention, held October 26-27 in Kona on the Big Island. Aloha mau! The Reverend Canon Sandy Graham, the diocesan canon for Congregational Life and Leadership, visited St. John's on Sunday, October 7, and gave the sermon. 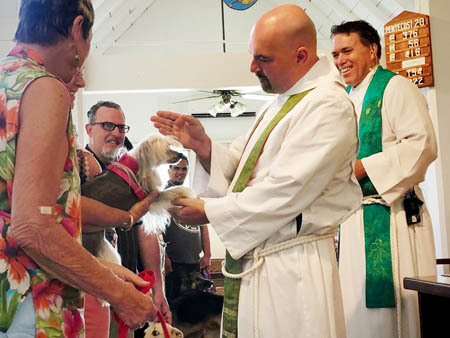 He also helped with St. John's "first annual" Blessing of the Animals, in honor of St. Francis of Assisi! Thanks to Ruth Shiroma Foster for this "action shot"! Mahalo pumehana to all those who helped make possible this celebration of special wahine in our lives, especially guest speaker Leah Caldeira, director of archives for Bishop Museum, for her inspirational presentation about Queen Emma; Jeannette Trevias for her wonderful music; Chef Yama and Chef Wade from Superb Sushi for the fantastic tempura and sushi; Kahala Lau from Kaleilaha'ole for the beautiful lei and floral arrangements. Our warmest thanks also to organizers Kawehi Lucas, Eileen Phillips, Jodi Shimabukura, Leone Leong, Rev. Nahoa Lucas, and Sam Smiley (see first photo), as well as others who worked tirelessly behind the scenes such as Sally Roggia and Enid Young (Enid in second photo with Sam). See additional photos. High school students from Te Awhiorangi, Lake Taupo, North Island, Aotearoa/New Zealand, were here for cultural exchange with local immersion and charter schools on O'ahu & Hawai'i island. 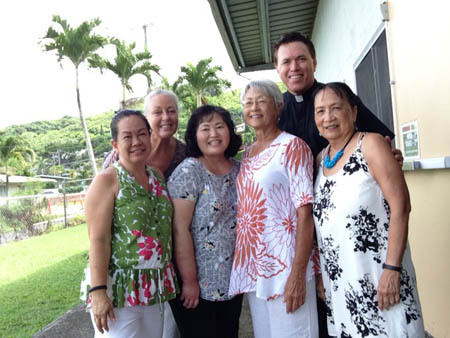 While staying at Ho'okano Hall, they joined us for Sunday worship on September 23, with our visiting celebrant Rev. Malcolm Keleawe Hee and Eucharistic Minister (and Outreach Coordinator) Tori Tualatamalelagi. Thanks to Ruth Shiroma Foster for this photo! 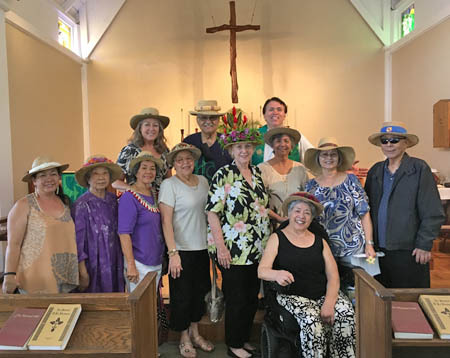 Several members of St. John's wore their special Hawaiian-style hats for the June 2018 Hawaiian-language service in honor of Kamehameha I! Aloha mai kākou! Please congratulate the Rev. 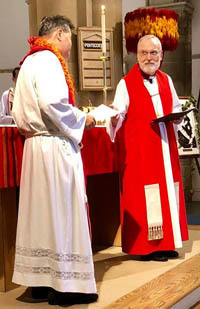 Dr. Malcolm Naea Chun, on whom Bishop Robert Fitzpatrick conferred the title of Honorary Canon for Native Hawaiian Ministry, in honor of the late Bishop Edwin Lani Hanchett, at St. Andrew's Cathedral on Pentecost Sunday, May 20, 2018. He is now officially the Rev. Canon Malcolm Naea Chun. With the title comes recognition of his many years devoted to the development of Native Hawaiian Ministry (NHM) in the Diocese of Hawai'i. 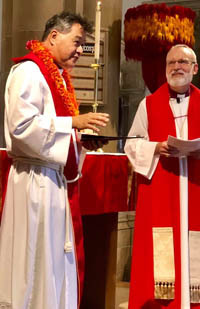 NHM continues in the diocese with Rev. Canon Chun, the other Native Hawaiian clergy, and the Commission on Native Hawaiian Ministry. 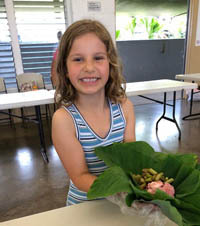 Mahalo to all who shared their time and energy in this year's laulau fundraiser! Can you believe that, in two days, we prepared and sold (out) 500 laulau? We couldn't have done this without our amazing crew of 25+ volunteers! Mahalo also to Vicki Fay for the photos and collages. In January 2016, Melanie Delva, who was then archivist for the Diocese of New Westminster and for the Ecclesiastical Province of British Columbia and the Yukon, visited St. John’s and gave a talk about her work for Canada's Truth and Reconciliation Commission. On February 4, 2018, Melanie, who is now the Reconciliation Animator for the Anglican Church of Canada, gave us an update on how the national church is responding to the commission’s 94 Calls to Action, working to honor the United Nations’ Declaration of the Rights of Indigenous Peoples, and supporting reconciliation among local congregations and other Anglican groups. About 30 music ministry coordinators, choir directors, clergy, and interested others gathered at Ho'okano Hall on Saturday, January 27, for an inspiring day of liturgical music and talk-story with Joe Kanoelehua Camacho, well-known liturgy coordinator, musician, composer, singer, dancer, and professional entertainer from the Big Island. Participants for this 3rd annual diocesan music conference came from many different churches on O'ahu, Kaua'i, and Hawai'i Island and brought their ukelele and guitars as well as their voices and lots of ideas to share, including some printed music. The mid-afternoon thunderstorm contributed a little drama but just added to people's desire to stay longer and keep singing till the rains subsided. Rev. Canon Sandy Graham put participants in email contact after the conference, and they are continuing to share thoughts and resources. Mahalo nui for this wonderful opportunity and to all who made it possible! 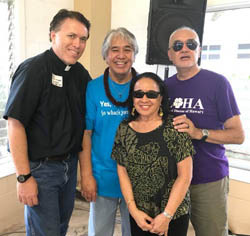 And special thanks to Susan Tomoso for these photos of Joe with Reverends Nahoa Lucaa, Mahi Beimes, and Hau'oli Tomoso!